TRaM stands for Translating Research at Melbourne and it is the pathway for research impact at the University of Melbourne. CHESM Director Professor Kim Bennell was recently featured in the Medibank Health Update, speaking about the rise of osteoarthritis in the community. The Australian Academy of Health and Medical Sciences (AAHMS) has elected CHESM's Professor Kim Bennell as one of 37 new fellows. CHESM's Professor Rana Hinman was recently awarded a prestigious National Health and Medical Research Council (NHMRC) Research Fellowship. CHESM director Prof Kim Bennell and one of our lovely participants spoke on Nine News recently about our RESTORE study for platelet-rich plasma for knee osteoarthritis. Congratulations to the Department of Physiotherapy's Dr Kim Allison who was awarded 1 of 6 prestigious Life sciences VESKI fellowships. The Victoria Fellowships are valued at up to $18,000 each to assist with an international study mission. A huge congratulations to Physiotherapy PhD student Pip Nicolson from the Centre for Health, Exercise and Sports Medicine (CHESM) for winning the prize for the best podium presentation at the 2017 British Association of Sports and Exercise Medicine (BASEM) scientific conference. Congratulation to Dr Michelle Hall on being selected through a competitive process to take part in the 2017 round of the “Researcher in Residence” Scheme, run by BioMedVic. This is a credit to her excellence as an early career researcher and to her mentors and colleagues in CHESM. 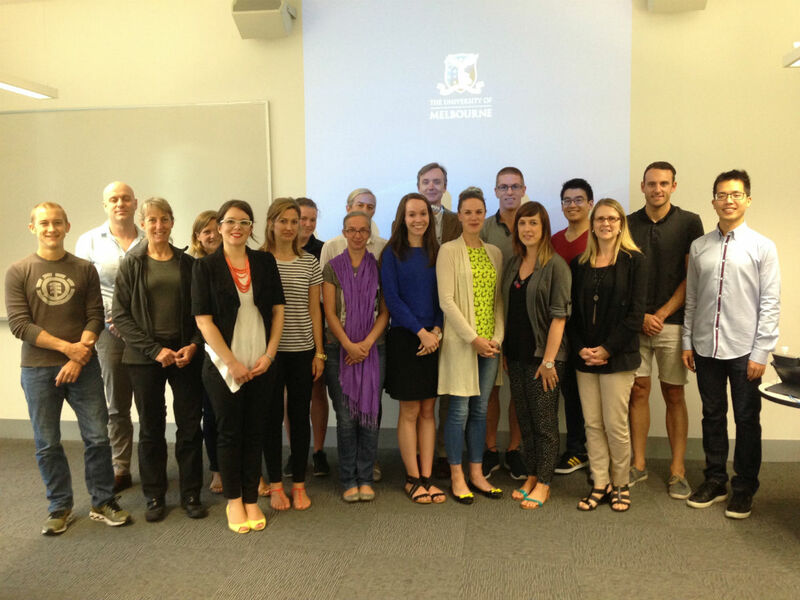 Professor Kim Bennell, Professor Rana Hinman and Mr Tim Wrigley from the Centre for Health, Exercise and Sports Medicine (CHESM) in the Department of Physiotherapy won the Award for Outstanding Research Higher Degree (RHD) Supervision in 2017. On Monday, the Centre for Health, Exercise and Sports Medicine published a key paper in the Annals of Internal Medicine, the highest impact journal (IFI of 16.59) of any specialty journal in the General and Internal Medicine category. Dr Michelle Hall was awarded a Sir Randal Heymanson Fellowship to commence in 2017. The Centre for Health, Exercise & Sports Medicine in the Department of Physiotherapy was awarded a VicHealth Award 2016 in the 'Research to Action' category for their IMPACT Project. Telephone coaching improves exercise adherence but not pain for knee osteoarthritis. Major report shows the growing multi-billion dollar costs of arthritis to the economy, individuals and to the healthcare system and how relatively small investments could yield savings of more than $170 million a year. Our main research focus is on the role of conservative strategies, particularly exercise, in promoting overall health and well being and in preventing and managing the public health problems that are currently facing society. To do this, a lifespan approach is taken from childhood through to the elderly years. A particular focus is the prevention and management of musculoskeletal conditions such as osteoarthritis. CHESM is committed to improving the wellbeing of all people through musculoskeletal research. By participating in a research study, you are helping researchers improve existing treatments and find new approaches which could benefit someone close to you and the community at large. The Centre for Health, Exercise and Sports Medicine (CHESM) houses a state-of-the-art movement research laboratory under the supervision of a full time Biomechanics Director. The Faculty of Medicine, Dentistry and Health Sciences is Australia's largest biomedical research faculty. We employ more than 1500 academic staff, 4000 honorary staff and 1500 graduate researchers undertaking world class research across a wide range of health and social issues in a diverse range of research settings. Researchers are located at key sites across Victoria, with more conducting research around the world. These renowned experts from every field can be found in labs, hospitals, affiliated research institutes and all across the wider community. Information and support tools for Faculty staff are available on the Faculty intranet. CHESM is looking for talented people to undertake PhD or MPhil research as part of our team. Our multi-disciplinary team includes people with backgrounds in physiotherapy, podiatry, biomechanics, engineering and exercise science. Candidates from a range of clinical and non- clinical backgrounds will be considered. Scholarships may be available for high-achieving candidates. A full-time postgraduate scholarship is available for a suitably qualified PhD candidate with an allied health, medical, exercise or science degree within CHESM to undertake research studies leading to a PhD. In October 2014, the National Health and Medical Research Council awarded $2.5 million funding over five years to establish the Centre for Research Excellence - Translational Research in Musculoskeletal Pain (Osteoarthritis and Low Back Pain). The CRE is being led by Professor Kim Bennell and 9 other chief investigators from institutes including: the University of Melbourne, University of Sydney, University of Queensland, Monash University, Keele University and University College London, UK. The Centre for Health, Exercise and Sports Medicine (CHESM) was established in October 2000. It is a multidisciplinary Centre within the Faculty of Medicine, Dentistry and Health Sciences administered through the Department of Physiotherapy. It combines high calibre researchers with experienced clinicians from a range of disciplines including physiotherapy, medicine, science, exercise science and podiatry. It also has a number of internationally recognised clinical associates and research collaborators.